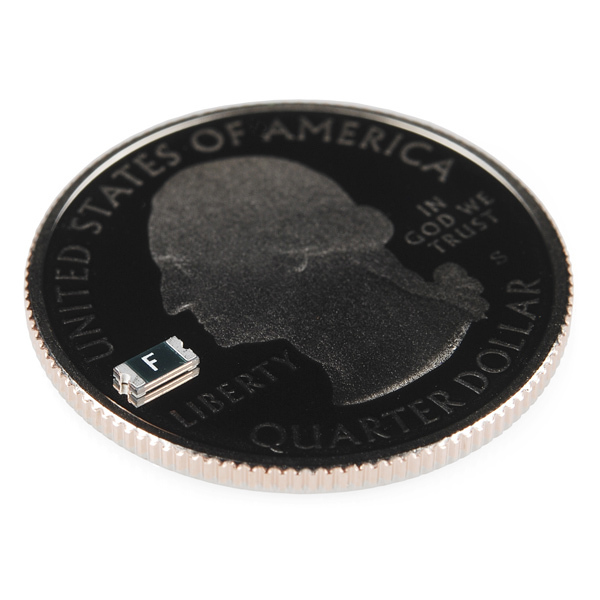 There are more and more hobbyists taking advantage of surface mount technology these days. With affordable tools like hot air and hotplate reflow ovens, electronics enthusiasts are shrinking their projects down to new levels of portability. 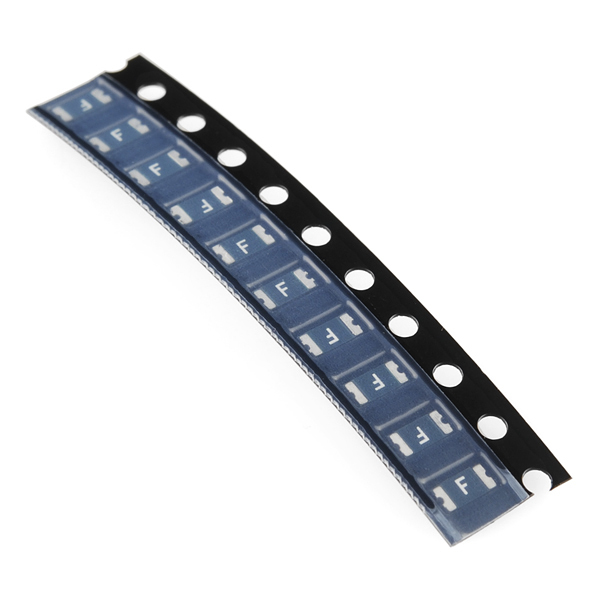 Unfortunately, It's not always easy to get your hands on small amounts of SMD parts so here's a strip of PTCs. PTCs are a form of overcurrent protection device (like a fuse) but unlike a fuse, they are capable of "resetting themselves." When the threshold current is reached, the device begins to heat up which increases its resistance, effectively choking the current back down to a level that won't damage more valuable components. When the current is removed, the device cools off and is ready to go again! This is a strip of 10 surface-mount PTC devices, which should be enough for general prototyping applications. PTC (positive temperature coefficient) devices are often used in products to meet regulatory safety requirements. They are not nearly as fast as other protection methods, so for prototyping a fast fuse or active current limit circuit will do a better job of protecting your downstream circuitry. 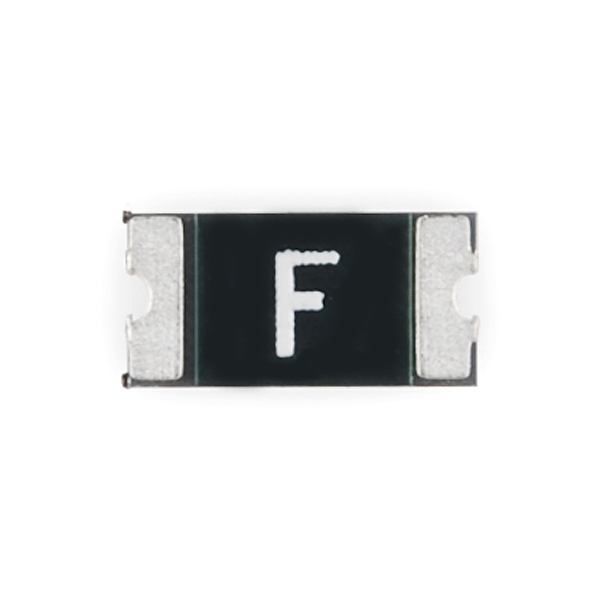 This "F" part is rated at 1A trip current (it won't trip until it sees at least 1A and resets when the current drops below 500 mA). And at 1A it takes over 10 seconds to trip. Did you mean a tenth of a second and not 10 seconds? the "F" is 1A trip current but 0.5A hold current, and yes it will take 10s at 1A but closer to 0.2s at 2-3A. so maybe not the fasted but you could us them on the line from the battery, and it will cut out before the battery started to heat up/ overheat. What size are these? 0603, 1206? Is this the same component that is used on the RedBoard? Any example circuit on how these might be used? (probably late but in case others ask) To use a fuse (PTC and normal) is simple. Just place the fuse between the supply and the circuit your protecting. if too much current goes trough the fuse (due to a short-circuit for example) it trips and then disconnects the circuit to protect it. just make sure all current from the supply goes trough the fuse and you can't do anything wrong. if you want even more protection you can place a rectifying diode before the fuse to prevent reverse polarity.